ARP Head Studs are a "must have" modification for any 7-bolt DSM or Evo 8/9 wanting to push 20+psi. ARP2000 Main Stud kit for your 4G63. ARP Stainless Steel Exhaust Manifold Stud Kit for the 7-bolt DSM/EVO. 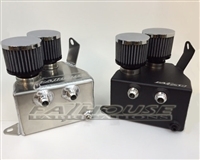 **FREE SHIPPING** Fathouse Fabrication's Battery Relocation bracket for Evo 8/9's. The STM Aluminum Weld-On 2" Bung & Cap are the perfect match for those DIY fabrication reservoir and overflow projects. The cap is anodized with a black finish and includes the o-ring seal. AEM Adjustable Cam Gear for the EVO 8. Fidanza Adjustable Cam Gears for the DSM/Evo 8. Price is for both gears. GSC Power-Division billet cams for your Evo 4-8 are available in multiple durations – S1 (268 duration); S2 (274 duration); S3 (280 duration). GSC Power-Division billet cams for your Evo 9 are available in multiple durations – S1 (268 duration); S2 (274 duration); S3 (280 duration). GSC developed this cam for the 2.2-2.4 lower revving engines with mivec control a profile that would allow for more air volume in the cylinder to help fill the larger displacement engines and make more midrange and top end power. 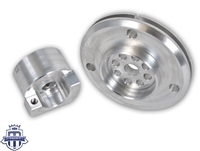 Kelford Cams for your Evo 8. Available in 264, 272, 280, and 288 duration. Kelford Cams for your Evo 9 (MIVEC). Available in 264, 272, 280, and 288 duration. Universal Catch Can can be used and installed on any car. Fathouse Fabrication's Mitsubishi EVO 8/9 Bolt In Race Catch Can.